We will stay again in one of largest hotels in Poland, Ossa Cogress & Spa. It is situated in calm countryside, away from city noise, what gives a possibility to take part both in conference and active outdoor rest. 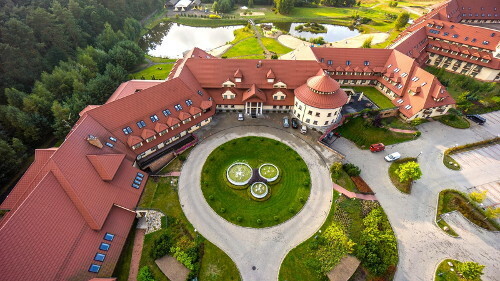 Hotel is located in the small village with same name, between Rawa Mazowiecka and Biała Rawska, next to the S-8 motorway. Initially, hotel makes available the amphitheatre hall, congress hall, workshop room and bedrooms in four-star standard and diversified comfort level (Standard, Premium, Standard Suite, Premium Suite) to beglad even most particular guest tastes. 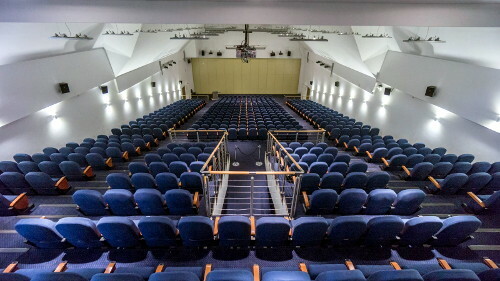 The slanted lecture hall, unique among Polish hotels and exceptionally spacious, also waits for you. The best airport for landing is the Warsaw Chopin Airport (WAW). We plan to organise a shuttle-bus or cab running between the airport and Ossa. In order to book it, send us an e-mail yet before paying. The cost of it is 10 € per single direction or 20 € per return. Bus or cab driver will wait at agreed time in the airport departures hall. You can recognise him by the "PHPCon Poland - Ossa" plate. There are quite a bit buses to Rawa Mazowiecka departing from the Warsaw West railway station. When you reach Rawa Mazowiecka, change bus to Biała Rawska (via Lesiew, not via Babsk) or evt. Grójec. The important is that bus should stop in Wólka Lesiewska, because you must leave a bus right there. Next, walk along the secondary road with direction Biała Rawska. Turn left on the first crossroad towards the Ossa (there's an advertising board of the Ossa Congress & Spa hotel). After a few hundred meters you'll see the hotel by left hand. The bus timetable from Rawa Mazowiecka you can find at this place. The best way to get to Ossa is Warsaw – Wrocław S-8 motorway. The town of Rawa Mazowiecka is situated between Warsaw and Piotrków Trybunalski (A-1 highway junction). You must leave S-8 motorway on the "Rawa Mazowiecka" junction, but not on "Rawa Mazowiecka Południe (south)". Then choose the 925 secondary road to Biała Rawska. After about 9 kilometers and the Wólka Lesiewska village turn left to Ossa. There's an advertising board of the Ossa Congress & Spa hotel. After a few hundred meters you'll see the hotel by left hand.